In a speech to his caucus and nominated candidates, Conservative Leader Andew Scheer warned that Canadians will wind up paying more taxes if they re-elect Trudeau's government. 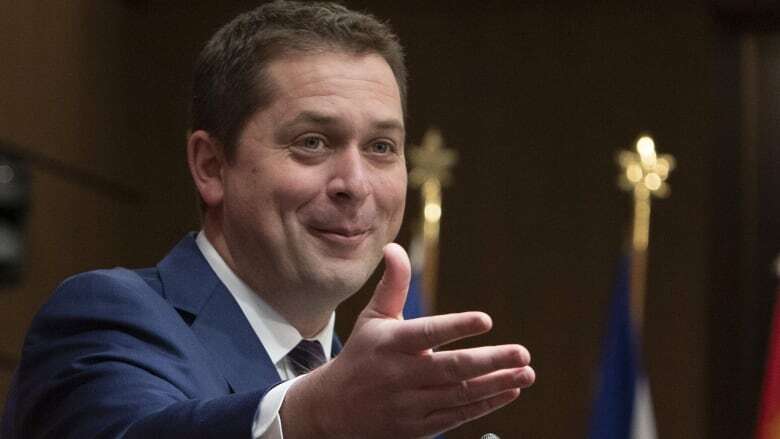 Canadians will pay more taxes if the Liberals are re-elected, Andrew Scheer warned Sunday as he rallied his Conservative troops for the last sitting of Parliament before an election this fall. The Conservative leader issued that rallying cry at the close of a three-day meeting with his MPs and nominated candidates — ostensibly held to prepare for Monday's resumption of Parliament, but with an eye firmly on the Oct. 21 election date. While he enumerated a host of Liberal shortcomings, Scheer zeroed in particularly on what he deems the fiscal failures of Prime Minister Justin Trudeau's government. "If you take one thing away from this whole weekend, it's this: If Justin Trudeau is re-elected, your taxes will go up," Scheer asserted. "If he is given another four years, everything — from the gasoline you put in your car to the food you put on your table to the taxes you pay to Ottawa — will cost you more money." As proof, Scheer pointed to the Liberals' carbon tax, which went into effect this year at $20 per tonne of carbon emissions and is slated to rise by $10 a year until it hits $50 per tonne in 2022. Beyond that, Scheer predicted a re-elected Trudeau government would find other ways to make Canadians pay more. "The biggest reason we know Justin Trudeau will raise taxes is because his never-ending deficits will force him to," Scheer said, claiming that the Liberals have "no plan to ever, ever, ever balance the budget. "It's as certain as anything in life: with Liberals, first come the deficits, then come the taxes." And the only thing that can prevent a Liberal victory is the Conservative party, said Scheer, while casting himself as the product of an average middle-class family — in contrast to Trudeau's privileged upbringing. "The everyday Canadians we fight for can't afford four more years of Justin Trudeau," he said. The Liberals wasted little time Sunday before firing back — another sign that an election is imminent. In a statement, Economic Development Minister Navdeep Bains predicted a Scheer government would "make deep cuts to services that Canadians rely on so they can give tax breaks to the wealthy." "The only people whose lives would be more affordable under the Conservatives are the super-rich," Bains said, lumping Scheer together with Ontario Premier Doug Ford as a right-wing populist. Bains noted that the Conservatives have voted against Liberal policies aimed at giving more money to families, including the new child benefit and a reduction in taxes for middle-income earners. Scheer boasted that the Conservatives are entering an election year "firing on all cylinders." He acknowledged that "some people say I smile too much," but said it's hard not to smile when the party has nominated more candidates than any other, and raised more money last year than any other non-election year. Moreover, he said Canadians are increasingly turning to the Conservative party as they grow tired of what he deemed Trudeau's mistakes: "damaged relationships with key allies and trading partners," backing down to Donald Trump on a renegotiated NAFTA, refusing to "get serious about the threat posed by China," wiping out pipeline projects, destroying confidence in the immigration system, "runaway spending and permanent deficits. "Canadian have gotten to know Justin Trudeau and his Liberals very well over the last three years and they don't like what they've seen," he said.